The violent suppression of protesters took place in 1989. 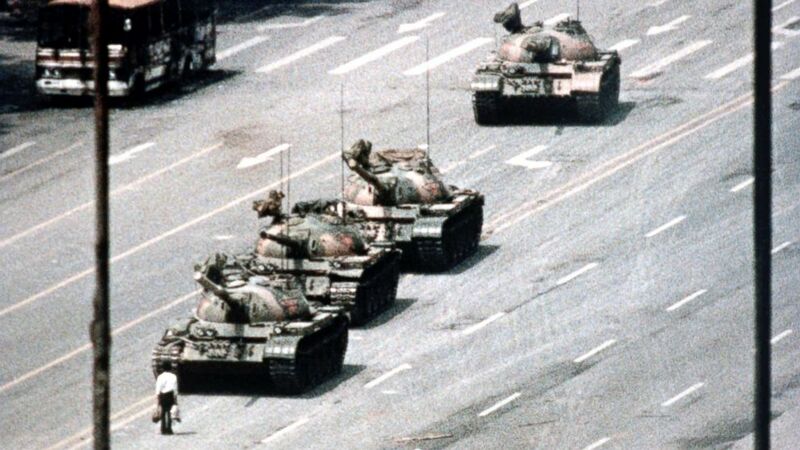 This year marks the 29th anniversary of China’s violent suppression of the Tiananmen Square protests of 1989. More than a generation later, this pivotal event in modern Chinese history still remains one of the most taboo subjects in China and one the Chinese Communist Party wishes could be forgotten to the pages of history. Every year as June 4 approaches -- the date the military retook the square from pro-democracy protesters -- security is stepped up, journalists are barred from the vicinity and internet censors block any references to the incident. Even references as oblique as "May 35" or emojis of a tank next to a man are scrubbed from the Chinese domestic internet. (Bettmann Archive via Getty Images) A Beijing demonstrator blocks the path of a tank convoy along the Avenue of Eternal Peace near Tiananmen Square, Beijing, on June 05, 1989. (Peter Turnley/Corbis/VCG via Getty Images) A sea of student protesters gathers in Tiananmen Square, Beijing, on May 4, 1989. Here’s why the events of June 4, 1989, continue to haunt the Chinese. Tiananmen Square is the public square in front of the Tiananmen Gate, or the "Gate of Heavenly Peace," where Mao Zedong’s portrait has hung since he proclaimed the founding of the People’s Republic of China on Oct. 1, 1949. First built in the 17th century by the invading Manchu-led Qing Dynasty and greatly expanded under the Communist government, the square at the heart of the Chinese capital has been the site of several historically significant events in Chinese history. Prior to 1989, the most significant protest occurred after the death of China’s first premier, Zhou Enlai, in 1976, when students initially gathered in the square to mourn the late Chinese leader. Chinese leader Deng Xiaoping opened up China’s economy in December 1978 and the 1980s was a decade of rapid change in China. The changing economy brought to some a sense of optimism after decades of turmoil as result of the Mao-led policies of the Great Leap Forward and Cultural Revolution. By spring 1989, China had reached a critical turning point. There was a nascent attempt at political liberalization and reform within the Communist Party led by Hu Yaobang, the party’s then-general secretary. The fast changes, however, also brought discontent over inflation and growing corruption. When protests erupted in 1986, Hu was ousted from power for what hardliners in his party thought was a meek response to stem the protests. 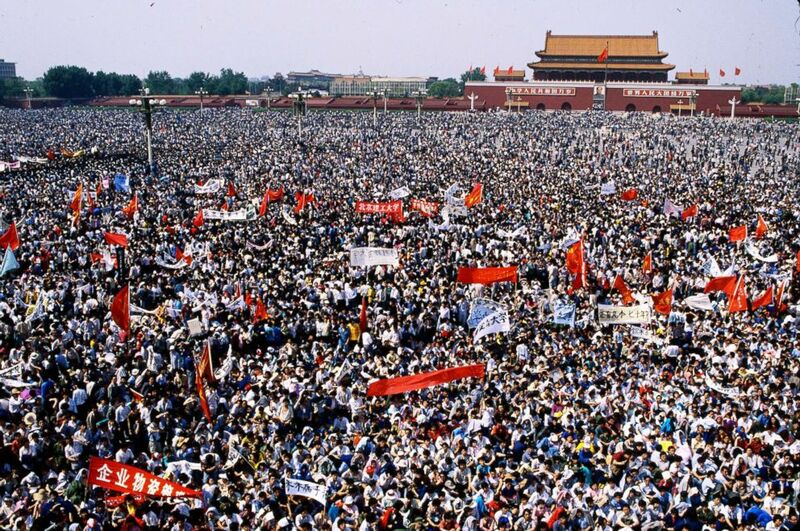 On April 15, 1989, Hu died of a heart attack and, taking inspiration from the 1976 protests, thousands of university students began to gather en masse in Tiananmen Square to mourn the former reformist leader. It soon grew into a pro-democracy protest with a list a demands to the central government, including government transparency, freedom of the press and freedom to protest. The student leaders sought a direct dialogue with the central government and party elders. 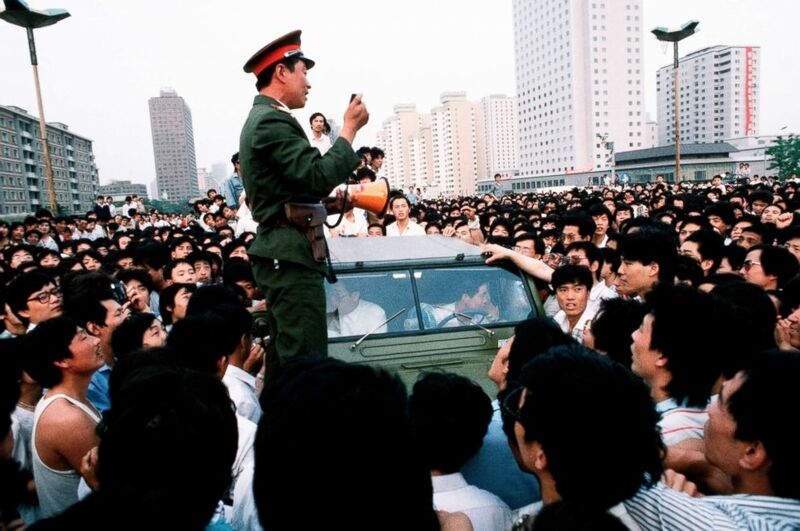 (Peter Charlesworth/LightRocket via Getty Images) An officer talks with a crowd of pro-democracy demonstrators who are preventing his convoy of trucks filled with soldiers from entering Tiananmen Square, Beijing, June 01, 1989. The ruling Communist Party became split over how to respond to the protests. It was the liberal reformers versus the hardliners. In the reformers camp was General Secretary Zhao Ziyang, who advocated opening a dialogue with the students. The hardliners, led by Premier Li Peng, later demonized as the "Butcher of Tiananmen," pressed his colleagues for more drastic action to quell the protests. Eventually it was Deng Xiaoping who broke the deadlock and sided with Li and the hardliners. Li eventually declared martial law on May 20 and Deng mobilized 30 divisions of the Chinese Army into Beijing, Zhao. The hardliners' victory changed the course of Chinese history with effects that are still felt today. The world’s press, including ABC News, was gathered in Beijing that spring for an entirely unrelated historical event. Soviet Union leader Mikhail Gorbachev was in town May 15-18 for the first meeting between the Soviets and Chinese since 1959. It was a mending of ties 30 years in the making -- drowned out by the student protesters that began a mass hunger strike just days before Gorbachev’s arrival. The demonstrations reached their apex on May 19 when an estimated 1.2 million people gathered in the square. Zhao made his final public appearance that night to plead for the crowds to leave the square. He refused to endorse imposing martial law and later spent the rest of his life under house arrest. 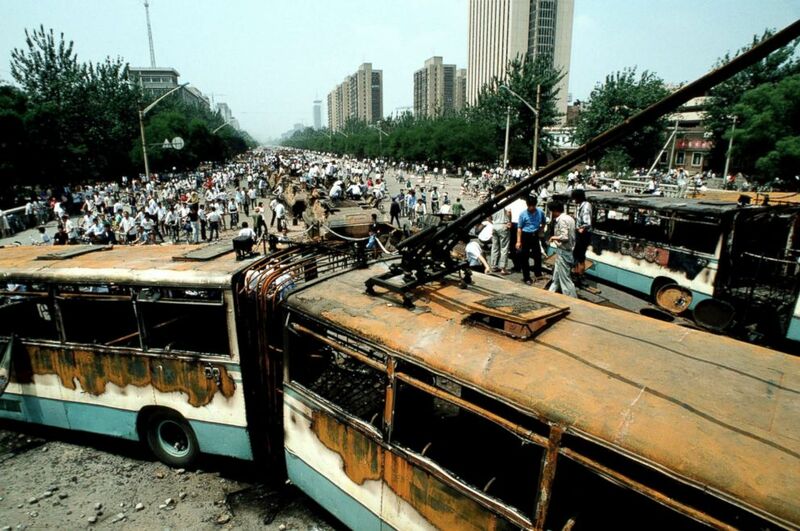 (Peter Charlesworth/LightRocket via Getty Images) People look at buses and Chinese Army trucks and vehicles that were damaged or destroyed during the night of violence in and around Tiananmen Square, Beijing, June 04, 1989. After martial law was imposed, an estimated 250,000 troops were mobilized into the Chinese capital but were initially blocked from entering the square. Finally, on June 2, Deng made the decision to retake the square by any means so that "order be restored to the capital." Thousands of soldiers entered Beijing in plainclothes and gathered inside the Great Hall of the People adjacent to the square. Orders were for military units to converge on the square at 1 a.m. on June 4 and for the square to be cleared by 6 a.m. According to Wu Renhua, a scholar and Tiananmen protester who later wrote three academic volumes documenting the event, soldiers were given standing orders that "no person may impede the advance of the troops enforcing martial law. The troops may act in self-defense and use any means to clear impediments." The first incidence of live fire on civilians was reported at 10 p.m. on June 3, some six miles west of the square. By 1:30 a.m. the army and its tanks had reached the square. There has never been a definitive death toll. Estimates range from a few hundred to over 10,000. All numbers are politically charged and in dispute. The Chinese government, in fact, continues to maintain that no one was actually killed in the square itself despite the event being best known as the Tiananmen Square Massacre throughout the rest of the world. A advocacy group called the Tiananmen Mothers, made up of family members of those who died in the crackdown, have over the years attempted to identify the dead. As of 2011, they had identified 202 of those killed. Most of the deaths occurred on the path leading up to the square as the army advanced, firing into the crowds and running people over with vehicles. The death toll was highest around Muxidi, about 2 miles west of the square. The Tiananmen Mothers identified 36 deaths in the immediate area and 18 more in a nearby hospital. British government files declassified in 2017 shows that the country's ambassador at the time, Sir Alan Ewen Donald, wrote on June 5, 2017, that a Chinese official told him the number of dead was close to 10,000. A U.S. embassy cable on June 22, 2017, however, said that "civilian deaths probably did not reach the figure of 3,000 used in some press reports." This number is similar to the initial 2,600 estimate the Chinese Red Cross gave on the morning of June 4, 2017, but later retracted. 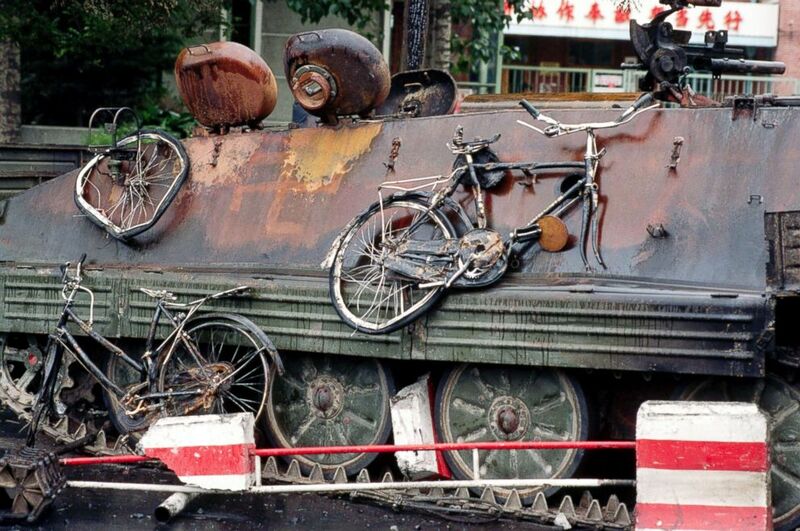 (Peter Turnley/Corbis/VCG via Getty Images) Mangled bicycles hang off the side of a PLA tank, which was burned by student protesters in Tiananmen Square, Beijing. Any hope of political reform and liberalization in China was an added casualty of Tiananmen Square. The reformers within the party were sidelined and any attempts at moving China’s political system toward democracy have gotten nowhere since 1989. The Communist Party now values stability at all cost. The Chinese government has doubled down on domestic surveillance to quell any nascent movement before it has a chance to begin. This was the lesson it learned from Tiananmen Square and continues to this day. The government embarked on growing the economy and fostering nationalism. An elaborate flag raising ceremony to boost patriotism and performed by 36 uniformed guards at Tiananmen Square didn't exist until 1991. Today, Tiananmen Square is one of most heavily monitored locations in the world. Security cameras cover every inch of the square and identification must be provided just to visit. Hong Kong is the only territory on Chinese soil that still manages to commemorate the lives lost on the square. On the mainland, the Chinese government’s generation-long censorship of the subject appears to have its intended effect. In planning her book, “The People’s Republic of Amnesia: Tiananmen Revisited,” journalist Louisa Lim asked 100 students at four Beijing university campuses if they recognized the iconic photo of a man staring down a tank taken in the square on June 5, 1989. Only 15 students could identify where the picture was from. Some did not even know it was taken in China.